What the Heck's an E-Book and What Does It Offer? - Perelandra Ltd.
AND WHAT DOES IT OFFER? Machaelle has been semi-patiently waiting for years for the e-book technology to catch up to our book standards. Finally, we can offer you the convenience of this exciting electronic advance. Our e-books are real books and are formatted like real books. You buy it through our web site, download it right away and save it on your computer. 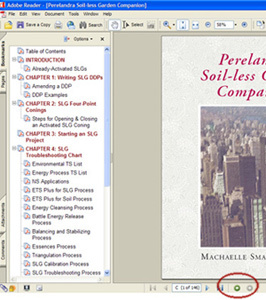 You can also download it from your computer to any PDF-friendly reader, such as Kindle, for the convenience of reading the book in any location. And then you can choose to read it from your computer or reader, or you can print a copy yourself. Besides providing immediate gratification, the e-books offer another great benefit — they are the ultimate in being environmentally friendly. Also, they save you money, time, shipping/handling costs and you don't have to deal with a bunch of pesky packing material. Our e-books are beautiful. Just because it's an e-book doesn't mean it can't be a pleasure to look at and easy to read. And with our e-books, you get extra touches. For example, you may easily search for that illusive bit of information that you know is somewhere in the book, and you have inter-text links and book-to-web links for easy and quick navigation. To get Machaelle's new e-books, start by buying the books online. We have fantastic step-by-step instructions for making your e-book experience easy as pie. For more information, see How Do I Get an eBook and Read It? When you open the e-book, you'll find your "Bookmarks" tab is already open and provides links that will take you directly to a specific chapter, topic or process. For example, in the Soil-less Garden Companion, this will come in handy as you begin working with your soil-less garden(s) and have a specific question or need the instruction for a process or step. You can go right to the process or information you need with one click. Throughout the book you'll find some of the text is blue (in MAP,the links are purple) — clicking on blue (or purple) text will either take you to our web site or to a referenced page within the book itself. We've set up these links, so as you are working through steps and you come to "see page 55," you just click on those words and you'll go right to page 55. Or if Machaelle says, "skip to step 7," you click and find yourself at Step 7. No scrolling or searching needed. Other links will take you to a specific page on our web site to give you more information on the topic, book or product mentioned. The e-book is set to open with the "fit to page" view (that means you see the whole page on the screen at once). You can change the view at any time and increase the page size so it's easier to read. When you click on a bookmark or link, the view will change to "fit to page." But when you return to the page you just left, you'll be right back at the same view (zoom) setting that you were on. If this makes no sense now, don't worry. When you start reading and clicking, we think you will understand this. But if you don't, we'll be happy to clear it up for you. When you click on a link that takes you to another page in the book, you can return to the page you were on by clicking the round "Previous View" button on the bottom navigation bar in Adobe Reader (see image at right). If your version of Adobe doesn't have those buttons, you can go to the "View" drop-down menu, select "Go To" and then "Previous View." For Kindle®, use your buttons to move as you do for regular Kindle books. For the external links (that take you to our web site) to work, you'll need to be connected to the internet. The first time you click on an external link, Adobe Reader will pop up a "Security Warning" and ask if you trust the web site. If you select the "Remember my action" box before clicking the "Allow" button, you'll only have to answer this question once. You can search any word or phrase and find that illusive bit of information that you know is somewhere in the book. In Adobe Reader, go to the "Edit" drop-down menu and select "Search." A search window will pop up at the side of your document asking what word or phrase you wish to search. Helpful hint: Make sure you have "In the current PDF document" selected before you click the "Search" button. In Adobe Reader, you can set up the view of the pages to your preference. You can view facing pages, just as if you had the book in your hands. Or if it is easier for you, the screen can be set up to show one page at a time. And you can change the "size" of the page to please your eyes, using the zoom buttons. All of the features we've described here are available in Adobe Reader versions 6, 7 or 8. If you're not a regular user of Adobe Reader, and you are new to e-books, we encourage you to go to the HELP button in Adobe Reader and click on "How to" for basic instructions to set your reading preferences. If you take the time to set up Adobe Reader to show the e-book the way you find it easiest to read and reference, you may soon find yourself hooked on e-books. With the right software, you can also "dog-ear" the pages, highlight text, make notes and more. Check out the HELP section of Adobe Reader to find out what's available with your software. new editions of a book or paper, but simply to new or upgraded versions of the file itself. And a pitiful plea for help: If you have the coveted "geek savvy" needed to know how to unlock the techno-mysteries of preparing documents for Kindle, iPhones, iPads, Blackberries, Sony Readers, etc., that allow for using the extra features these devices offer, please take pity and contact us! How Do I Get an eBook and Read It?